If you are planning to build an array of solar panels, first you need to determine the number of Photovoltaic (PV) panels required to meet your energy output goals and then start assembling them. 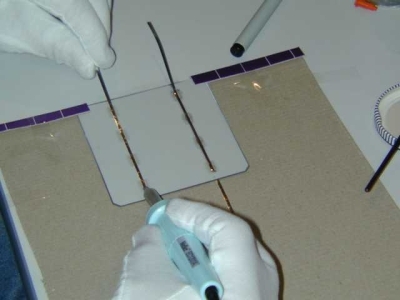 In order to do that you need to understand as to how to wire your panels together. Read the points enumerated below to understand not only the difference between parallel solar panel installations and series solar panel installations but also the one that best suits your need. Visualize three polar panels are lying next to each other on the ground with a positive and negative terminal on the top and at the bottom of each panel, respectively. You have two options and can exercise any of these to wire these panels together using the terminals. One of the options that you can opt for is to run the wires along the top and the bottom of each panel, connecting the positive and negative terminals together, respectively. This is a parallel solar installation; however, you should also understand the implications when you wire your panels in this manner. When you use this method to wire your panels in parallel, the total voltage output remains the same as it is in a single panel; however, the amperage (amps) output becomes the sum of the output of each panel. Let us consider the fact that you get 12 volts and 3.5 amps for each of your panels. Therefore if you wire your panels in parallel, the cumulative output of your three panels is going to be 12 volts whereas, you will get 10.5 amps. Now if you increase the number of panels from three to six, the voltage output remains the same at 12 volts whereas, you can get amperage of 21. Now, consider the second option and again visualize the same three unwired solar panels lying next to each other on the ground. You are now going to wire them in series; this means, instead of wiring the positive terminal of one panel to the positive one of the next panel, you are going to wire the positive terminal of this panel to the negative one of the panel next to it. Perform this process for each of your panels and your array of solar panels will be wired in series. Now let us understand the consequences of wiring the array of solar panels in series. Here, the amperage remains the same and the voltage output is the sum total of voltage output of the three panels. Considering the above example of panels, now your amperage is 3.5 whereas the voltage output increases to 36. Again, if you increase the number of panels to six, you amperage remains the same at 3.5, but you can get 72 volts. Now the million dollar question is which wiring style should you opt for; it all boils down to the system that you want to charge. For example, during your camping trip if you want to charge up your 12 volt RV system, you need to set up your solar panel system in such a manner that you get an output of 12 volts. Let’s assume that you have two solar panels, each of which produces 12 volts at 3.5 amps. In this case you need to wire them in parallel so that you get 12 volts and increase the amperage to 7.0. On the other hand, if each of your two solar panels produces 6 volts at 3.5 amps, you need to wire them in series to get an output of 12 volts at 3.5 amps. Another thing you should understand that no matter whichever method you choose, the total power output remains unchanged. The total power is measured in watts and hence to find out the total wattage of your charging system, simply multiplies the amps with total volts. See the example below: 12 volts x 10 amps = 120 watts 120 volts x 1 amp = 120 watts. Therefore, there is no difference. To understand the difference between parallel and series wiring, simply remember parallel wiring = more amps and series wiring = more volts.